First Response Commander Jake Marsh is on the scene to help childcare owner Rachael Long when a masked man breaks into the daycare and tries to kidnap one of Rachael's children. Determined to keep the man from taking the child and also determined to identify the man, Rachael rips off his mask! Now Rachael is in danger and Jake is determined to do all he can to keep her safe. Both Rachael and Jake have lost people in their lives that have left them feeling guilty and unworthy to be loved again. Both have thrown their energy into their work. Now that Jake is protecting Rachael they both feel the attraction that they instantly have for one another, but neither one is ready to open their heart to love. Christmas Conspiracy is the last book in the First Responders series and it definitely kept this reader on the edge of my seat! 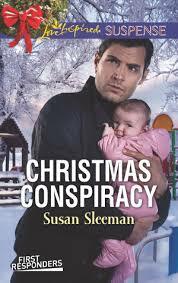 Christmas Conspiracy starts off with heart-pounding action and that action continues throughout the whole story. I love Jake's character. He is protective and tender with Rachael and willing to give up his life in order to keep her safe. We are able to catch up with the rest of the team and see how the other relationships have developed. Although I am sad that the series is over I have enjoyed each of the team members stories. If you are a romantic suspense fan like I am then don't miss out on this fantastic series!